Note: The following biography of Daniel Greysolon Sieur du Lhut was written by Duluth pioneer Van Brunt, Walter and appeared in 1922’s three-volume Duluth & St. Louis County, Minnesota: Their Story & People, which Van Brunt himself compiled and edited. It would be well, perhaps, to begin with a reference to the various spellings of the names Gresolon and Duluth encountered in the written records. Hugo explains that the bronze tablet placed on the house in Montreal once occupied by Gresolon gives the name as “Daniel de Gresolon, Sieur Dulhut,” but there is great variance in the rendering of the name by the different chroniclers. Lahontan renders it as Grisolon; McLennan spells the patronymic in two ways, as Greysolon and Gresollon; Winter, Thwaites, and Schaefer give it as Greysolon. There is even greater variation in the spelling of the title. Duluth was generally known as du Luht, it appears; he was so styled in the Margry papers, and that, it has been stated, was the spelling he himself used. But there are records of him under the name of du Lud, du Lude, du Lhut, Dulhut, and du Luth. The official rendering of the name, as recorded in the archives of the Province of Quebec, is Daniel de Gresolon du Luth (duLhut, Dulhud). The Colonies Recruited from European Aristocracy. Duluth was a man of good family, and it was not surprising to find that he was of the “petite noblesse” of France, for in colonial times, Canada attracted many of the younger and more adventurous, and it must be stated poorer, scions of noble houses of France, just as the younger sons of English aristocrats settled in the southern colonies of the United States. Montreal, in the time of Duluth, had an aristocratic setting and society, and a royal edict had so elevated commerce in furs, that men even of noble family might engage in that trade without loss of prestige or privilege. To some extent that dignity clung to fur-trading operations until comparatively recent times, and many of the early managers of fur-trading posts, even in most distant parts of North America, were men of superior education and genteel lineage. Daniel de Gresolon, Sieur Duluth, was born at Saint-Germain-en-Laye, near Paris, France, in, about, 1654. St. Germain at that time was for a portion of the year the resort of the French court. Duluth’s paternal lineage was noble, but in the maternal line he came of the wealthy Patron family of merchants, there being also a strain of Italian blood in the family. While there appears to be little doubt that Duluth was born in St. Germain, it would seem that he lived much of his youth in Lyons, the home of the Patron family. It is probably on this account that Duluth is qualified as a gentleman from Lyons, by La Hontain. He chose the army, as a career, which it was fitting he should do, as a “gentleman born,” and the son of well-to-do parents. He received assignment, as ensign, to a Lyonnaise company, but soon became a “Gendarme de la Garde du Roi,” which was recruited only from the “gentility.” Of this latter office he was particularly proud, and boasted of it all his lifetime. But he was apparently a young gentleman of virile disposition, was ambitious, and with a clean mind and active body was more attracted by the rumors of adventurous possibilities in New France than by the somewhat effeminate environment of the king’s court. He was not content in remaining year after year near the royal presence, as a gendarme of the royal guard, when each returning ship brought back stories of the wonderful possibilities of rapid advancement in the colony. Duluth was not without friends and relatives in his new home, states Schaefer. Among them were: a brother, Claude Gresolon de la Tourette; an uncle, Jacques Patron; and two cousins, Alphonse and Henri de Tonti. All held important positions in New France, and perhaps were of help to the young man in getting established in the new country. Duluth settled in Montreal, though the records do not make it clear whether prior to his return to France, in 1674, he held his commission in the marine corps, or whether he entered into trade. It would seem that he held government office, or was in active military commission, for mention is made of the Boucher family, to the society of which Duluth’s commission gave him ready “entree.” Hugo wrote: “Among the children of the old Boucher family were several girls, who, with their brothers, formed a portion of the select society which clustered around the government officials, and to which the officers of the celebrated Carignan-Salieres Regiment and other troops were accepted as welcome additions.” However, between the time of his coming to Montreal and his return to France in 1674 some years probably elapsed, for France was at war with Holland from 1672-79, and a chivalrous young soldier of the King’s Guard would hardly have forsaken his home land at such a time. Indeed, he would probably have seen opportunities of far more rapid advancement at the battle front than in the distant colony. So it is feasible to suppose that Duluth reached Montreal shortly before 1672. McLennan, however, in his “Gentlemen of the Royal Guard,” writes: “The first glimpse we catch of him in his new surroundings is in 1674” … “Duluth must have been about twenty years of age at this time.” Hugo records that “in 1674, at the altar of the chapel of l’Hotel Dieu (Montreal) he received his first communion, in company with a number of young men whose names are indelibly inscribed in the annals of the new country. Among them were the three brothers of the old Le Moyne family, ennobled by letters patent from the king, through the intercession of the Intendant Talon.” This was the first communion taken by Duluth—his assumption of the communion, states Hugo. It is stated that Duluth returned to France “to settle some family matters.” That may have been one reason, but it appears that, upon arrival in France, he found his old comrades of the Royal Guard preparing for service under Conde against Prince William of Orange, and that without hesitating Duluth joined his comrades. He served with distinction in Conde’s campaign of that year, was with King Louis XIV and Vauban in the second conquest of Franche-Comte, April-May, 1674, and took part in the bloody battle of Senef (August 1674), serving as squire to the young Marquis de Lassay, ensign of his regiment. Duluth rendered good service in that battle, as did also a young Recollet priest, Hennepin, whom he was destined to meet under different, yet equally exciting, circumstances some years later, on the shores of the Mississippi River near the limits of the State of Minnesota. Maybe Duluth did not again take up his captaincy of marines after returning from France. He seems to have had his mind set more on trade. Hugo wrote: With the title of Captain Duluth, which title he held by courtesy only as he was not regularly commissioned as captain till many years after, our future explorer settled down as a citizen in business, living with his younger brother, Claude Gresolon de la Tourette. He was a partisan of French Canada’s greatest governor, Count de Frontenac, and as such was persona non grata with Bishop Laval and the Jesuits with whom Frontenac was at variance. Little doubt can be entertained of his participation in the schemes for profit in the fur trade which was connived by the governor in order to secure the necessary money for living expenses, his salary of 8,000 livres not being sufficient to keep up the dignity and state assumed by the representative of Louis the Magnificent. Frontenac was a real governor, and his magnificent court and display went. far in impressing the Iroquois. Frontenac arrived in Quebec in 1672, so that Duluth must have been thrown in contact with him from the moment of his landing in America. Schaefer states that the year after Duluth had leased the “modest house” from Pierre Pigeon, the young soldier “built a more elegant dwelling on a beautiful site overlooking the majestic St. Lawrence River.” Continuing, Schaefer records: He retired from his command in the colonial troops at half pay, and lived in his establishment with his brother, La Tourette, and a common friend of theirs, Jacques Bixard, formerly captain of the guard of the Governor Frontenac. Apparently, Duluth had settled down to the quiet life of an ordinary citizen, and was intent upon peaceful pursuits. Apparently, Duluth built his larger house with the thought that he might prevail upon the fair damsel with whom he was, and for years had been, enamoured to accept his hand and heart, and become hostess in his new home. But that young lady, daughter of the Boucher family, which was becoming increasingly prominent in colonial society, disapproved of his plans to enter trade, and “differences of opinion between Duluth and his lady love became of frequent occurrence.” Eventually, there came a parting, and soon afterwards Duluth decided to leave Montreal, and plunge into the dangers of the Far West, thinking perhaps that there he might forget his love. 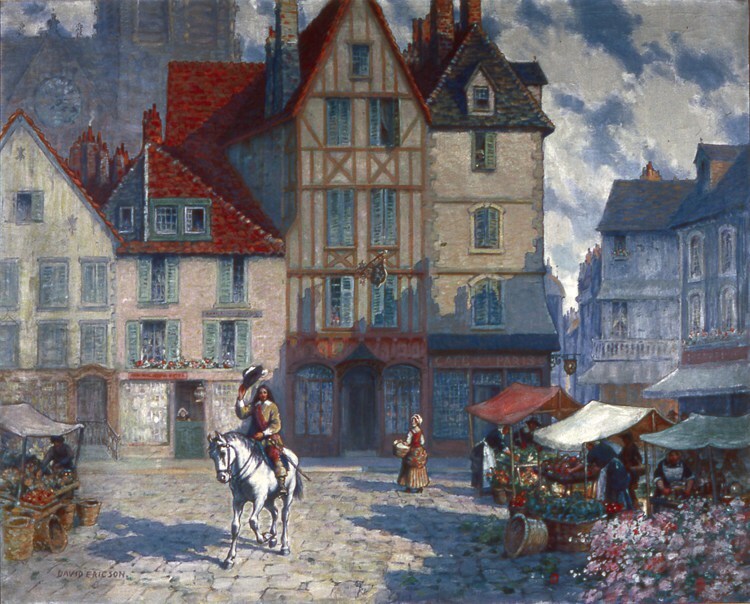 He sold his home on St. Paul Street to his uncle, Jacques Patron, for the sum of 9,000 livres, and “accepted a position offered him by Count de Frontenac, whereby he represented him, and through him the king, in extending the boundaries of New France in parts not before reached,” states Hugo. Duluth invested his money in a trading outfit, and prepared himself for the voyage “by cultivating the friendship of the Indians.” He succeeded so well in this task, that “as a token of their good will some of them presented him with three slaves, whom he had asked for as guides in his coming journey.” On September 1, 1678, the party, which consisted of three Huron Indian slaves and eight Frenchmen, including Duluth and his brother Claude, departed from Montreal, proceeding up the river Ottawa to Mattawa, thence by that branch to Lake Nippissing, thence on the French River to the northeast corner of Georgian Bay, thence through the inside, or north, channel to St. Mary’s River. Winter came upon them when they were in the neighborhood of the Sault Ste. Marie, close to the shores of Lakes Huron and Superior. Duluth built a cabin at a distance of about three-quarters of a league from the Sault, where there was still a village of the Saulteurs, or Ojibways. And before he left that camp he wrote a letter, which bears the date of April 5, 1679, to Count Frontenac, explaining the object of his voyage to the wilderness of the West. Duluth had been rather indiscreet, having in fact violated a colonial law. Whether he had applied to the governor for license to seek trade in, and expand the realm of the king to, unknown western lands, is not clear; and possibly before departure his thoughts were filled more with the desire to without delay leave scenes which would constantly remind him of his lovelorn condition than to take such legal measures as were necessary to secure governmental sanction to depart. Apparently, the comparative solitude of a winter spent in the forest brought this grave omission more forcibly to his mind. At all events, Duluth in his letter to Governor Frontenac endeavored to fully explain the earnestness of his purpose, and of his unfailing loyalty to the king and colony. Schaefer writes: He had left Montreal without the license of the governor; and he did not wish to add one fault to another, by hiding from the authorities the purposes he had in view in contravaning their legitimate orders. His intention was to go to the country of the Sioux, and win their friendship, and to induce the Saulteurs, or Ojibways, to make peace with the Sioux, with the Assiniboines, the Crees, and the Monsouis of the North. In this manner, the dominions of his majesty, the King of France, would be extended to countries hitherto unexplored; and the French of Canada would gain considerably by the increase in the fur trade. The nations being at peace, would be able to secure large numbers of castors, or beavers, of which there was an abundance around the shores of Lake Superior; and being bound to the French by ties of friendship, they would take their peltries to Montreal and Quebec, rather than to the English at Hudson Bay. In order to cement more closely this pact of amity between the savages and the French, some of the Sioux with some from among the Ojibways, were to go down to Montreal, and be presented to the governor. Duluth eventually carried out these intentions almost to the letter, although he was not destined to receive the honor and reward that were his due for such achievements. Duluth did not pass the winter idly. He held several conferences with the Saulteurs, or Ojibways, and explained the advantages that would accrue to them if they lived in peace with the Sioux; and he ultimately gained their good will, so that when, in the spring of 1679, the clearing of ice made it possible for him to continue his voyage along the south shore of Lake Superior, he had the satisfaction of knowing that at least one branch of the Ojibway tribe favored his plans. Now, we come to a point where the historians differ, a difference of importance to the City of Duluth. Did Duluth strike inland while still on the south shore of Lake Superior, or did he continue his voyage on that lake until he came to the headwaters, e.g., until he came to Duluth? There is every reason to believe that he did. Hugo’s arguments are convincing on the point. Hugo considers that Duluth landed at the base of Minnesota Point on, or about, June 27, 1679, while Schaefer thinks that Duluth struck inland through Wisconsin, and was not on the St. Louis River, in the vicinity of Duluth, until September of that year. The arguments are here presented, in the words of the chroniclers named. Hugo wrote as follows: History is annoyingly silent concerning the doings of the Duluth party from the fall of 1678 till midsummer 1679, except to state that they wintered in the vicinity of the Sault. A reasonable conjecture, however, is that having in mind his principal mission, that of extending over the Sioux country the banner of the Lilies of France, he would skirt along the south shore of Lake Superior as soon as the ice disappeared, till he reached Keewenaw Point, when he would cross to the north shore for better shelter under the northern highlands, and to be protected from the prevalent winds. If this is a correct theory, and it is what a canoe man under Duluth’s conditions would do today, he landed at the base of what is now Minnesota Point, crossed it by the ‘Little Portage,’ (which has existed from the time when memory and traditions fade into the long past) and came into Duluth bay. It will be remembered that Radisson, who was at Keweenaw Peninsula about two decades earlier, recorded the information then conveyed to him by the Indians that Isle Royal was one long day’s canoeing distant from the point, and that in the morning of the following day the north shore of Lake Superior could be reached. And that probably was the course taken by Duluth. However, the south shore was followed closely to the end by at least one noted Lake Superior voyageur, Governor Cass, who held council with the Indians at Fond du Lac in 1826. To continue Mr. Hugo’s version: Then he went up St. Louis River, portaging the rapids, thence by the Savannah and the usual canoe routes to his objective point, the village of the Sioux. This route has been outlined from incomplete data and a knowledge of what would be done under similar circumstances in Indian times, for instance, the experiences of Ely, the early missionary, and others. The “Little Portage” was so called to distinguish it from the “Grand Portage” on the north shore of Lake Superior, in the vicinity of Pigeon River, which river forms the boundary line between the United States and Canada. This place, where the white men established a trading post, was an important point for them from the earliest visits, and was used by the Indians from all time. The “Little Portage” was well marked and defined within the memory of those now living in Duluth, but it is now obliterated by the digging of the Duluth ship canal which practically followed the line of the portage. The date of Duluth’s landing in what is now his principal monument, the city of Duluth, Minn., must have been about the 27th of June, 1679, because it is known that on the 2nd of July, 1679, he planted the banner of France, His Majesty’s Arms, “in the great village of the Nadouecioux, called Izatys, where never had a Frenchman been nor more than at the Songaskitons and Houetbatons, distant six score leagues from the former, where I also planted His Majesty’s Arms, in the same year, 1679.” This quotation is from Duluth’s letter to the French minister of marine, the Marquis de Seignlay, in refutation of the allegations made against him that he had deserted the little colony to engage in the fur trade, and had enticed others to follow his example. …from the time of his arrival in the Indian village of Izatys, Duluth made the benefits of trading with the Frenchmen known to the several tribes. He soon found himself justified in calling a general rendezvous of the northern tribes of Indians at enmity with the Sioux, with the idea of inducing them to make peace. The council was held on the 15th of September, 1679, in the Head of the Lakes territory, and the evidence points to Fond du Lac, Minn., as the exact place, as it was an important portage point on a regular canoe route. The meeting was satisfactory. There are many reasons that support the belief that Duluth had his mind set on reaching the St. Louis River. That was his port—his destination on Lake Superior—determined upon, perhaps, before he had left Montreal. His chief desire, it may be assumed, was to reach the country of the Nadouessiens (Sioux) as quickly as possible, by the most direct route, and if he had access to the map of “Lac Tracy or Superieur” drawn by Jesuits in 1671—as it is reasonable to assume he would have had—it would have been at once clear to him that the direct route to the country of the Sioux tribes of Minnesota was by way of the St. Louis River. Another reason why he would probably want to reach that headwater before going to the Sioux country was that he would like to have the Ojibways of Minnesota, one of the principal villages of which tribe was then at Fond du Lac, declare whether they would follow their Sault tribesmen in “burying the hatchet,” and agreeing to devote themselves to pursuits of peace, instead of living under the existing almost perpetual state of war. It would seem that Duluth would like to be strengthened by this assurance before proceeding further with his mission to the Sioux tribes. However, Schaefer did not consider this a possibility. He wrote: In the spring of 1679, he (Duluth) continued his journey westward (from the Sault). Probably he went some distance along the southern shore of Lake Superior, and then struck inland, in a southwestern direction, until he reached the principal village of the Sioux tribe, known as the Issati (people of Knife Lake), who lived in a settlement in the neighborhood of Lake Mille Lacs, Minnesota. Here he planted the Royal Arms of France, on July 2, 1679, and placed thus the wild tribes of Minnesota and their territory under the sceptre of His Most Christian Majesty. The same act was performed a little later in the summer among the tribes of the Songaskitons and Houetbatons, who dwelt about 120 leagues further inland. Duluth claims that before him no Frenchman had ever set foot on the soil inhabited by the various tribes of the Sioux, or Dakota Indians. In this, he is not correct; for some time before him Groseilliers and Radisson had come to these regions, and if they did not go so far west as Duluth, it is nevertheless true that they spent some time in the Sioux country. It is more likely that Duluth had no knowledge of the voyages of these predecessors of his. The events occurred before he reached Canada, and the description thereof was made in the English language, and for the benefit of the English, whose service the above explorers sought then to enter. While thus visiting the various tribes of the Sioux, Duluth intimated to the Assiniboines and other nations of the North (Crees, Monsiuis, and Ojibways) to assemble for a peace meeting with the Sioux, their common enemies. This great gathering took place on Sept. 15, 1679, at the extremity of Lake Superior, very likely on, or near, the spot where now rises the prosperous city of Duluth. Representatives of all these nations were there. Duluth succeeded in winning their esteem and friendship, as well as in bringing them closer together by pacts of peace and amity. In order to strengthen these new ties, he arranged for reciprocal marriages between the members of the various tribes. By the way, Schaefer states that the journey to the Sioux country in the summer of 1679 was made by land. It will be seen that these two historians, Hugo and Schaefer, agree that Duluth was in the vicinity of Fond du Lac (which is now within the City of Duluth) in September, 1679. Yet another Duluth historian, Judge Carey, a worthy pioneer resident of that city, disagrees with both. While admitting that “there can be no doubt but that Duluth visited and traded with the Indians at Fond du Lac … and traveled over the Grand Portage between Fond du Lac and Sandy Lake,” which fact can hardly be disputed, for Duluth himself wrote of the Grand Portage “at the western extremity of Lake Superior,” Judge Carey was of the belief that the Indian council of September, 1679, was held much farther north—at the point where Duluth, it is thought, established his first trading post. Carey wrote as follows: Duluth “established a post at Kamanistigoya, which was about fifteen leagues from the Grand Portage at the western extremity of Lake Superior; and here, on the 15th of September, 1679, he held a council with the Assenipoulax (Assiniboines) and other tribes, and urged them to be at peace with the Sioux.” Carey was evidently quoting from some other writer, but his own comment reads: The Kamanistigoya here mentioned is probably now known as Pigeon river, where he established the post and held the peace council on Minnesota soil. We now know that Carey is incorrect geographically in his interpretation. As to the quotation, it is at best ambiguously worded; it is not clear whether the writer wished to record that the council was held at the post, or at the grand portage. In any case, if the grand portage of the Fond du Lac is the one referred to as being “at the western extremity of Lake Superior,” it is perhaps hardly necessary to point out that the Pigeon River is far more than fifteen leagues distant from the St. Louis River and Fond du Lac. Hugo is clearer. He wrote: After this meeting (the Indian council) Duluth spent the winter in the woods with the Indians. He held meetings, formed hunting parties of both Ojibways and Sioux, spread feasts, summoned councils, and in every way which would appeal to the Indians he endeavored to build up a closer relationship. … His winter wanderings took him so far east as the Pigeon and Kaministiqua rivers, on the north shore of Lake Superior. On the Pigeon River was the village already alluded to as “Grand Portage” where a trading post was established. While at this oldest town in Minnesota, he saw the great possibilities and the need of a post and fort on the Kaministiqua River, which he was able to build later, on the side of that river below the Kakabeka falls, where Fort William now stands. There does not seem to be any good reason for arguing that Duluth might have meant the Grand Portage of the Pigeon River in referring to that “at the western extremity of Lake Superior”; he could hardly have thought of differentiating between two Grand Portages, by thinking of the Pigeon River one as at the northwestern extremity, and the portage of Fond du Lac as at the southwestern extremity of the lake. A glance at the map of Lake Superior published six years before he reached its waters, and which map he would probably have had access to, would have at once shown him that there could be no possible confusion as to the western extremity being the waters leading to Fond du Lac. That much of doubt may be dismissed. Duluth undoubtedly was at Duluth, even though it is not clear that he made it his center of operations, for he does not seem to have established a trading post at Fond du Lac. Indeed, his commercial aims apparently were directed more to the diverting of trade from the Hudson Bay Sphere to Montreal, and his fur-trading headquarters were presumably at the post he established on the Pigeon River. Consideration of the foregoing will bring one to the realization that there is logical evidence that Duluth was in Duluth waters in June of 1679; and there is nothing sufficiently convincing in contrary interpretations to justify students in believing that Duluth did not stand at Little Portage, on Minnesota Point, on June 27, 1679. The evidence seems to conclusively prove that Duluth actually was in the vicinity of what is now the site of the City of Duluth not once only but many times during the next year. Also, it is reasonable to think that the Indian council of September, 1679, was held at Fond du Lac, which would be the logical central rendezvous for the Sioux of the south and the tribes of the north. All could reach the gathering place by way of the St. Louis River and connecting waters, north and south. Further proof, if needed, is given by Dawson, who, in making reference to the Mille Lac planting of the royal arms of France by Duluth, stated: Other towns were also visited, and Duluth gathered in September of the same year a great council at Fond du Lac, the extreme western end of Lake Superior. He may have passed the greater part of the winter and early spring on the Pigeon River, in matters of trade, but in June, 1680, he was again at the western extremity of the lake, with plans of empire rather than of trade. He was probably hopeful that the doubt as to the southwesterly direction of the Mississippi River, and of its flowing into the western sea, might be cleared by him, with all the glory and fame that such a discovery of the long-sought-for route to the Indies would bring him. He also desired to further strengthen the sought-for friendship between the Sioux and the other tribes, and of all with France. Therefore, in June he started with an Indian interpreter and four Frenchmen in two canoes. They paddled along the southern shore of Lake Superior for about eight leagues, states Schaefer, from its western extremity, until they reached a river, the Bois Brule, which flows into the lake. There the party entered, went upstream, made a portage of about half a league, struck a lake, the upper St. Croix, and its outlet, the St. Croix River, which Duluth descended until he came to the Mississippi.